I have never understood how it is possible for almost everyone who writes to objectify his sufferings in the very midst of undergoing them; thus I, for example, in the midst of my unhappiness, in all likelihood with my head still smarting from unhappiness, sit down and write to someone: I am unhappy. Yes, I can even go beyond that and with as many flourishes as I have the talent for, all of which seem to have nothing to do with my unhappiness, ring simple, or contrapuntal, or a whole orchestration of changes on my theme. And it is not a lie, and it does not still my pain; it is simply a merciful surplus of strength at a moment when suffering has raked me to the bottom of my being and plainly exhausted all my strength. 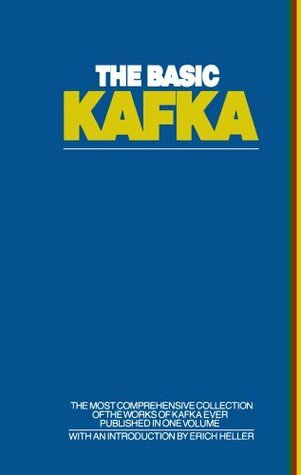 As a young man firmly in the grasp of the compulsion to write, struggling with what that meant, floundering with the evil twin of wanting to be published, I read, re-read, marked in, and carried around (also compulsively) a copy of The Basic Kafka. The mid-term assignment I now use in my first year seminar that is writing intensive invites students to interview professors, academics, or writers about their lives as writers; one of the questions I recommend they ask is about what compels them to write. Many students are surprised to find that so many who write have extremely conflicted relationships with needing to write, wanting to write, or being compelled to write (and that many academics dislike writing, dread it). I have many writer-Selves, and I share that with students. The writer-Self for me most like what Kafka details in his journal is my poet-Self. In all writing contexts—poetry, blogging, scholarly work—I am compelled; these are not things I choose to do. But the poetry is the most beyond my conscious control. For lack of a better way to explain it (odd, yes, for someone who calls himself a writer: as Kafka also warned, words tend to fail us), poems simply come to me. And therein is the problem. With blogs and scholarly work, there is certainly inspired writing. And with all my writing, the moment I finish a piece I am immediately petrified I’ll never again have anything to write. This is what being a writer is. But the great bulk of prose writing allows me to make some decisions, step back, reject ideas, experience fits and starts, and sometimes abandoning all together. To ignore a poem is like turning your back on a child. So recently I felt moved—in other words, these poems called out to me to write them—to write poems about the shooting of Jordan Davis, poems that feel akin to poems written about Trayvon Martin: Four Poems: For Jordan Davis and Trayvon Martin. The latter represents the most difficult part of being a poet—being compelled to write poetry—for me. I was (I am) petrified by the piece. The topic is hard, the language walks a thin line of confrontation and offense, and the act of writing poetry about other people’s tragedies feels invasive. Writing is necessarily and simultaneously two contradictory things: intensely solitary and private as well as nakedly public, communal. One aspect of the communal element of writing is that many writers thrive on collaboration—the most important of which is an editor or readers who see drafts before a wider public reads the work. Scholarly work often goes through several drafts and editors before publication. 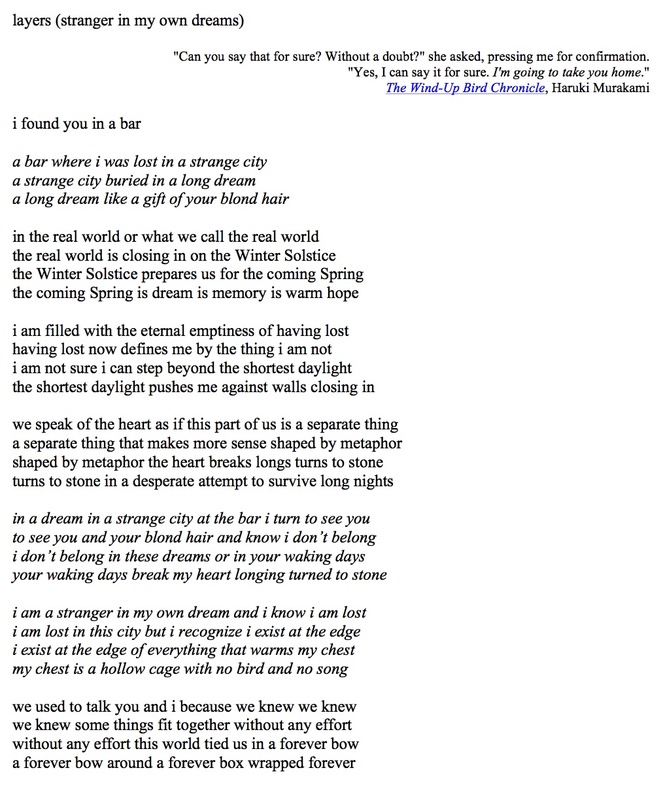 My blogs and poetry, however, tend to reach readers after having passed only my eyes and mind, and there is a terror to that, a terror that suggests that only those compelled to write would continue to go through the process. Many writes have confronted all this, possibly few better than Kafka. So key moments sustain the writer (and I would argue all artists)—and the writer above all else needs sustenance; and therefore, it is no surprise Kafka wrote again and again about hunger and starving (see A Hunger Artist). The other moment is selfish and comes also in that solitary state. And then being a writer creeps across your skin as you are immediately petrified that you’ll never again write anything that good. And so we steel ourselves against the insecurities of being a writer, the fears that threaten to paralyze. We recall and imagine the kind reader, and then we move on, feeding the beast within us. It is ravenous and self-consuming, yes. The woman picked up her black bag and, still bent over, headed for the door. “Will I see you again?” Samsa asked one last time. “If you think of someone enough, you’re sure to meet them again,” she said in parting. This time there was real warmth in her voice…. The only thing he knew for certain was that he wanted to see that hunchback girl again. To sit face to face and talk to his heart’s content. To unravel the riddles of the world with her. He wanted to watch from every angle the way she twisted and writhed when she adjusted her brassiere. If possible, he wanted to run his hands over her body. To touch her soft skin and feel her warmth with his fingertips. To walk side by side with her up and down the staircases of the world. Just thinking about her made him warm inside. No longer did he wish to be a fish or a sunflower—or anything else, for that matter. He was glad to be human. For sure, it was a great inconvenience to have to walk on two legs and wear clothes. There were so many things he didn’t know. Yet had he been a fish or a sunflower, and not a human being, he might never have experienced this emotion. So he felt. It was very early in the morning, the streets clean and deserted, I was on my way to the railroad station. As I compared the tower clock with my watch I realized it was already much later than I had thought, I had to hurry, the shock of this discovery made me feel uncertain of the way, I was not very well acquainted with the town yet, fortunately there was a policeman nearby, I ran to him and breathlessly asked him the way. He smiled and said: ‘from me you want to learn the way?’ ‘Yes,’ I said, ‘since I cannot find it myself.’ ‘Give it up, give it up,’ said he, and turned away with a great sweep, like someone who wants to be alone with his laughter. This blog is a place for me to examine and share that paradoxical tension between the drive to express coupled with or pushing against the inevitable sense of alienation from Self, Others, and Time. The guiding metaphor of all my writing has become quilting, in the sense that no ideas or words are purely original, but that discourse is always the sewing together of the remnants we gather in hopes of offering something new and valuable and even beautiful in our endless quest. This book is a hybrid work of sorts—the combination of commentaries and Op-Eds weaved into a larger scholarly work confronting how many different stakeholders in universal public education—politicians, corporate leaders, political appointees, the general public, administrators, teachers, and students—view poverty, people living in poverty, students learning in poverty, and teaching and learning. The commentaries and Op-Eds I published in traditional publications and through online media such as blogs add to the larger scholarly work both discourse aimed at a wide readership and interactive discussions impacted by online writing prompting and allowing readers to post comments and engage me as a scholar in a living and evolving conversation. While this book is primarily a work about U.S. poverty and education in the twentieth and twenty-first centuries, my work as a scholar is tied inextricably with my work as a writer; thus, the work itself, like all of my work, is a commentary on discourse and writing. Just as assumptions about poverty and education impact and tint how we address both, assumptions, conventions, and norms about discourse control not only what is expressed but also how discourse is presented. One hybrid aspect of this book is the blending of discourse aimed at the general public and a scholarly audience. Too often, I believe, public discourse lacks the evidence-based elements necessary in scholarly work (citations and references that allow the readers to examine the validity of the claims made in the piece) while scholarly work tends to be expressed in language and media that create an insular discourse, scholars speaking to scholars. Another element of the book that often creates tension when I submit work for publication is what I frame as quilting; I view scholarly discourse as a fabric weaved out of a community of voices. The use of citations and quoting sources to illuminate and reinforce claims are essential elements of presenting scholarly authority (in the Freirian sense of authoritative, not authoritarian), but many conventions of scholarly writing encourage burying the voice of the cited scholars within paraphrasing. I, instead, tend to highlight in quotes not only the claims of my citations, but also the voice itself—how the claim is framed by the source. This stylistic choice celebrates the collaborative and communal nature of making scholarly claims, although it comes with risk within the academic community that is often deeply conservative about discourse conventions while being more embracing of radical ideas and claims. Making scholarly and public claims creates a tension for democratic ideals: What voice matters, and should all voices matter equally? Democratic ideals suggest that all voices must be honored, but rarely do we confront in our democracy the weight of each voice—does giving credibility to expert voices over inexpert voices betray democracy? To argue for social equity, human agency, and equitable schools, making a parallel argument that some voices are more valid than others appears hypocritical, but therein lies the paradox of critical scholarship genuinely committed to democracy and human agency. My arguments and evidence, then, have been an organic act, informed by my scholarship and by interacting with readers within the new media world of online publications and discussing topics with readers. While this book becomes a fixed statement, it too is part of a living and breathing tapestry, a quilt offered as a place to begin and maintain a discussion that leads toward a more equitable education system that feeds a more equitable society. This is a confrontation of many types of poverty—the poverty of economics that imprisons people in a society driven by privilege, the poverty of access, the poverty of voice, the poverty of information ironically persisting in a world bombarded by media. Inequity is the life-blood of privilege, and the privileged depend on the majority of the public to stop thinking and obey. Let’s not.